With Pala Presents, we offer selections from the library of Pala International’s Bill Larson, who shares with us some of the wealth of information in the realm of gems and gemology. The following text, is the result of the extra mile gone on the subject of corundum by Greville, a friend and contemporary of James Smithson. Analysi crystallorum, tam ejusdem quam diverse figuræ, multurn lucis scientia expectat. Bergman. Opusc. de Terra Gemmarum. HAVING contributed to bring into notice the mineral substance from the East Indies which is generally called Adamantine Spar, I beg leave to lay before the Royal Society the following account of its history and introduction. About the year 1767 or 1768, Mr. William Berry, a very respectable man, and an eminent engraver of stone, at Edinburgh, received from Dr. Anderson, of Madras, a box of crystals, with information of their being the material used by the natives of India, to polish crystal, and all gems but diamonds. Mr. Berry found that they cut agate, cornelian, &c.; but, in his minute engraving of figures, upon seals, &c. the superior hardness of the diamond appeared preferable; and its dispatch compensated for the price: the crystals were therefore laid aside, as curiosities. Dr. Black ascertained their being different from other stones observed in Europe, and their hardness attached to them the name of Adamantine Spar. My friend Colonel Cathcart sent me its native name, Corundum, from India, with some specimens, given to him by Dr. Anderson, in 1784, which I distributed for analysis. When the native name was obtained, it appeared, from Dr. Woodward’s Catalogue of Foreign Fossils, published about the year 1719, that the same substance had been sent to him from Madras, by his correspondent Mr. Bulkley. In Dr. Woodward’s additional Catalogue of Foreign Fossils, published in 1725, p. 6. ζ. 10. “Nella Corivendum is found by digging at the foot or bottom of hills, about 500 miles to the southward of this place. They use it as emery, to clean arms, &c. it serves also to grind rubies, by making it like hard cement, by the help of stick-lac mixt with it. East India. Mr. Bulkley.”—These, with a few others in Woodward’s Catalogues, are the only instances by which any author, prior to 1768, appears to have noticed this substance. This information being unsatisfactory, and every appearance of the stone indicating it to be part of a stratum, I wrote repeatedly to friends in India, to ascertain, if possible, the situation of the rock, and, if near the sea, to send a considerable quantity, as ballast, with a view of applying it to cut and polish granites, porphyry, and other stones, which the high price of cutting and polishing excluded from useful or ornamental work. But my inquiries at Madras were fruitless: by some I was assured it came from Guzarat. From Bombay I obtained no satisfactory information. At last, in the year 1793, I obtained a satisfactory account. Sir Charles Oakley was disposed to oblige me: he was then Governor of Madras; and his success is due to the activity and judgment of Mr. Garrow. Mr. Garrow knew how difficult it was to avoid the causes of my failure, from every Hindoo being occupied by the duty of his cast; scarcely thinking on any thing else, and, whenever his interest is concerned, being suspicious and reserved. Mr. Garrow, in the first place, ascertained the cast connected with Corundum to be the venders of glass bangles; that they used it in their business, and sold it to all other casts. This cast of natives, at all times, had free access to every part of Tippoo’s country; nor, until the districts about Permetty were ceded to the English, could it be procured in any other way. Mr. Garrow depended on his personal inspection; the particulars are contained in the following letter, communicated to me by Sir Charles Oakley. I derived so little satisfaction from the various accounts given me of the Corundum, from the indifference of the natives to every subject in which they are not immediately interested, that I resolved to ascertain the particulars I wished to know, on the spot where the stone is found. The glassmen agreed in one material circumstance, that the place was not far from Permetty: in other particulars they disagreed, apparently with intention to mislead. It is near a fortnight since I dispatched a servant I could depend on to Permetty, with one of these people, who, on his arrival there, probably through fear of his cast, said he knew no farther. My servant persevered, and informed me he had found the place I wished to see. I arrived at Permetty, by the route of Namcul, the 6th; and, learning that the distance to the spot was about 3½ hours or 14 miles, I left Permetty in time to arrive there about sunrise the next morning. At this time no person but my servant was present, and, from a continued excavation at different depths, from 6 to 16 feet, in appearance like a water-course, running in length about a mile and a half east and west, over the brow of a very rising ground, I saw at once the place from which the stone was procured. The prodigious extent that at different times appears to have been dug up, with the few people employed, shews that it has been a business of ages. The ground through which the vein of excavation runs, and of course the mineral, commands one of the finest and most extensive prospects it is possible to conceive. The surface of the ground is covered with innumerable fine alabaster stones, and a variety of small shrubs, but not a tree sufficient to shelter my palanquin. There is not the appearance of an habitation within three quarters of a mile. The nearest village is called Condrastra Pollam. In this village are about 30 small thatched houses: among these are 5 families, who, in descent by prescriptive right, are the miners, and dig in the pits. The nearest place of any consequence, in Rennell’s Map, is Caranel, on the south side the Cavery. The distance of the pits from the river is above 4 miles; but the ground between prevent its being seen in a direct line. A fine view of the river is seen near Erode; which fort, as well as Sankerdroog, are plainly visible with the naked eye, as is also the Coimbitoor country, south and west of the river, to an immense extent. I procured, at Permetty, a cadjan from the Bramin manager to the head man of the Pollam; which, on my arrival at the pits, I sent to him; and soon after three of the miners came from the Pollam, with their implements, and families following with provisions. As they came up, they inquired of my servant how they were to address me, having never seen an European before. I followed them into a pit, in the line of the excavation, above 14 feet from the ground-level. The instrument they used is a very heavy iron crow, ending in a broad point, with a straight wooden handle, clampt with iron. The soil they cut through is of different colours, but composed chiefly of a gritty granite; and, at the depth of seven feet, are layers of a substance not unlike dried pitch, which crumbles into small flakes when taken out. With considerable labour, the miners, with the points of their crows, cut out several pieces of the strata, of some pounds weight each; and, when a considerable quantity was broken off, it was carried up and crushed to pieces, with great force, by the iron crow. Among these broken lumps, the Corundum stone is found; but in many of the pieces there was none. The mode of getting it, made it difficult to get any with the stratum adhering to it; this, however, after several trials I obtained very perfect, and shall forward to Madras, with specimens of the strata at different depths. The stone is beyond ail comparison heavier than the substance which encrusts it. It appears extraordinary how this stone, so concealed, should under such difficulties have been sought for, and applied to any purpose; and that the knowledge of the few people who dig for it, and who do so from father to son, is confined entirely to the finding the stone. For they told me they knew none of its uses, and that the labour was so hard, and their gain so small, that they would, through choice, rather work in the fields; that the sale of it from the spot is confined solely to the glass sellers, who vend it over the whole country, and who had, while I was there, above forty Parriar horses, bullocks, &c. ready in the Pollam, to carry it to Tinnevelly, and the southern countries; through which track, if the stone is known in Europe, I apprehend it has found its way, by means of the Dutch. The people on the spot declare it is to be got in no other situation or place whatever; and the stone-cutters tell me they can do nothing without it. It pays no duty, either where dug up or retailed. The colour of the stone is either very light brown or purplish, in the proportion of twenty to one of the latter; but in use no preference is given, and they are used equally. To an indifferent person, the most striking circumstance is its great weight. As the spot I have been speaking of now composes a part of the Company’s territories, the most minute information on the subject may be acquired. I felt particular satisfaction in having been the first European who was ever at the place; and I shall be much gratified if the account given meets with your approbation. I shall dispatch a load of the stone, in a day or two, which I got at the Pollam, with the charge of it. The distance from this place, by Namcul, is 84 miles. The Charge of 50lb. Weight of Corundum. Nine Tritchinopoly measures of the Corundum stone weigh 50lb. The stone is delivered by measures, and paid for at the Pollam, in the gold fanam. This letter contains very interesting topographical observations on the mine. The specimens sent were of one sort, of a greyish colour, with a shade of green. The entire crystals, which I selected among the broken ones, were of course few in proportion; but, with the addition of some distinct crystals, which Col. Cathcart and Capt. Colin Macauley had sent me, have been sufficient to ascertain the structure and form of the crystals, of which an analytical description will close this Paper. I shall, therefore, now say nothing concerning their form, but proceed to give an account of the varieties of Corundum stone, which I have obtained from India and China. In the year 1786, Col. Cathcart sent me a small fragment of a stratified mass from Bengal, with this label; “Corundum, much inferior in price to that of the Coast.” It is of a purplish hue; its fracture like compact sand-stone; and a confused crystallization appears in all parts of the stone, by fibres of a whiter colour, from which the light is reflected, as in feldspar, &c.
I have since obtained a larger lump of the stone, of the same texture, but rather paler in its purplish hue. Sir John Macgregor Murray informed me that it is called by the natives of Bengal, Corone, and used for polishing stones, and for all the purposes of emery. Its specific gravity is 3,876. Capt, Colin Macauley procured a lump of Corundum from a sikuldar, (a polisher, this term is most appropriate to polishers of steel,) in whose family it had been above twenty years employed, for grinding and polishing stones or gems. The use to which it had been so long devoted had occasioned grooves in its surfaces, which facilitated greatly the examination of its structure. It is about 5½ inches long, 3½ inches broad, and above two inches thick. On one of its broad surfaces are two oval grooves; one of them is four inches long, one broad, and ¾ of an inch deep. On the opposite side is a shorter oval groove, above 2½ inches long, 1½ inch broad, and one inch deep. In these grooves, the ends of the laminæ of the mass reflect the light, like the crystals. It serves as a specimen of the simple apparatus of an Indian lapidary. Stones polished in these grooves would be of the common India polish and form, en cabochon, which is often called tallow drop, from the French lapidaries’ term goutte de suif, convex, oval, or circular. A very small quantity of the Corundum powder would be required, as the action of the powdered Corundum and gems, on the lump of Corundum, would, as appears from the depth of the grooves, wear away from it a supply of powder, for the operation of polishing. It appears to be part of a larger mass, is of a purplish colour, and of the same laminated texture as the crystals of Corundum; it has this peculiarity, there appear cracks, branching irregularly across the laminæ of the lump, which are filled with homogeneous matter, distinguished however by the superior purity which might be expected to arise from the degree of filtration required for its deposition in the fissures. Some of these cracks, which terminate on the surface, appear to have the same crystallized arrangement which characterizes the laminæ of Corundum. The cracks not being in any degree influenced in their direction by the laminæ of the crystallized mass, it is probable they had not been consolidated, when they cracked; and, from this specimen, we may expect to find Corundum cementing masses of stone, by the same process of stalactitical cementation by which quartz and calcedony connect great nodules and masses of siliceous stones. In this specimen, I consider the veins as pure Corundum, that is, having the same specific gravity, hardness, and texture as Corundum crystals; and I found the whole lump possessed all the qualities of Corundum, except its specific gravity, which amounted only to 2,785; and in this property it corresponded nearly with the matrix of the Corundum crystals, or the vein in which Corundum is before stated to be found; the specific gravity of which is 2,768. The texture of the matrix appears sometimes like adularia, and confusedly crystallized; often compact, like cipoline or primitive marble; sometimes sparry, sometimes granulated, and, on the outside of the vein, and near fissures, decomposed, and becoming opaque. In all its states, it scratches glass, but not rock crystal, possibly from want of adherence of its particles; and in this it differs from the substance of the above lump, which cuts glass and rock crystal with great facility. This lump, and the matrix of Corundum, appeared to possess the same properties as Corundum, when examined by the blow pipe, with the different fluxes. The matrix of Corundum having sometimes an appearance like adularia and feldspar, I ascertained, by Mr. Hatchett’s scales, the specific gravity of adularia to be 2,558, and of feldspar 2,555. The Corundum, and the lighter Corundum of the lump, cut adularia and feldspar; the latter effervesced, and combined with soda, which the former did not. It is therefore evident, that the matrix of Corundum, or substance of the vein, is a distinct substance from adularia and feldspar, and nearly connected with Corundum. The matrix or vein contains also a black substance, like shorl, which, on closer observation, appears to be hornblende. This substance Mr. Garrow had remarked to have the appearance of charcoal, and, on that account, he had attributed the formation of these strata to the agency of fire. Other gentlemen, from the appearance of the matrix of Corundum, have stated it to be a calcareous vein. Mr. Garrow observed, that there ran through the strata in which the Corundum was found, veins of a substance like dried pitch, apparently on their edge, which separated like a pack of cards. It is a brown micaceous substance, which in drying foliates, and shews a certain degree of regular arrangement of the component parts; in this case, the fragments of the folia subdivide, with some degree of regularity, into rhombs, whose angles are 60° and 120°: it is more smooth, and less flexible, than pure mica. These are all the sorts of Corundum which I procured from India. I now proceed to the result of my inquiries in China. I requested Capt. Gumming, in 1786, at that time commanding the Company’s ship Britannia, to take a specimen of Corundum to China, to ascertain its nature, and to obtain specimens, if possible, adhering to their matrix, and regularly crystallized. On his arrival at Canton, he collected the information I wished, with the good sense and zealous desire which he always exerts for his friends. He ascertained that the stone I inquired for, was in common use with the stone-cutters; and he brought me the stone, in its rude and in its pounded state, taking care to select the most regularly crystallized pieces, and others adhering to the rock. A stone-cutter was sawing rock crystal with a hand-saw, which he also brought to me; it is a piece of bamboo, slit, about 3 feet long, and 1¾ inch broad, thickened at the handle by a piece of wood, rivetted with two iron pins; having a lump of lead tied with a thong of split rattan, steadying an iron pin, on which the end of a twisted iron wire is fastened, which, being stretched to the handle, is passed through a hole in the bamboo, with the superabundant wire; a wooden peg, being pressed into the hole, keeps the bow bent, and the wire stretched, and serves to coil the superfluous wire, till, by sawing the crystal, the stretched wire is worn, and requires to be renewed from the coil. The twisted wire answers the purpose of a saw, and retains the powder of Corundum and water, which are used in this operation. Dr. Lind had before brought specimens similar to the above, from China. From Sir Joseph Banks I obtained Dr. Lind’s specimens, and some in powder, which Mr. Duncan, supercargo in China, had sent him, with the Chinese name, Pou-sa. The matrix, being mixed with a red and white sparry substance and mica, is generally called red granite; but it appears to me of the same nature as the matrix of Corundum from India. The white is more fibrous, and like cyanite; the red part of it is compact and opaque; other parts appear to foliate, and pure mica is in considerable patches, and generally adheres to the crystals. This Corundum is of a darker brown, and more irregular on the surface than the Corundum of the Coast, and often mixed with black iron ore,  attractable by the magnet. It is described as the third modification of the Corundum crystal, in the analytical description which follows. The chatoyant or play of light, on these dark crystals, is very remarkable; some are of a bright copper colour; others exhibit the accident of reflection of light, which, in a polished state, gives varieties to the cat’s eye, star-stone, sun-stone, &c.; which, as yet, are classed from such accident, without strict attention to their nature, which is various, and in general has not been ascertained. These are the circumstances connected with the strata worth mentioning. The examination of Corundum on which our present knowledge rests, is nearly that which an Indian mineralogist might derive of the history of feldspar, from a lump of Aberdeen granite, out of one or two different quarries. He might ascertain a few modifications of the crystal of feldspar, its fracture, and matrix; but he would have no knowledge of the purest or more beautiful sorts which other quarries produce, in Scotland, at Baveno, at St. Gothard, and in Auvergne. I therefore think it essential to mention, that Corundum, under circumstances favourable to its crystallization, becomes glassy in its fracture, and of various colours. I have not only observed, in crystals of Corundum, specks of a fine ruby colour, but I have fragments of crystals, in texture and every respect like the colourless Corundum, of a fine red colour. It is certain that we obtain from India, Corundum which may pass for rubies. I have sent to India some of the Corundum with small ruby specks, which were not sufficiently distinct or large either for measurement or analysis, in hopes of being enabled to ascertain correctly the form of Salam rubies found in Corundum; in the mean time, I have the Corundum of a fine red colour. Looking over some polished rubies from India, I selected one which appeared laminated like Corundum, and had also the chatoyant or play of light on its laminæ, which formed an angle in the stone. The lapidary called it an Oriental ruby. I altered the form of the cutting, so fortunately, that the reflected rays formed a perfect star; a phenomenon I had observed in the sapphire, and expected in Corundum, but not in the octoedral ruby. The specific gravity of this stone, being 4,166, confirmed my opinion that it is one of the Salam rubies, so much esteemed by the natives on the Coast or Peninsula of India, which are found in the Corundum vein. The specific gravity of a colourless sapphire, very little less opaque than Corundum, forming also a perfect star, was 4,000: that of a deep blue sapphire, and of a star-stone, 4,035; all which I connect with the Corundum; the specific gravity of a distinct crystal of which was 3,950; of a fragment of ruby-coloured Corundum, 3,959; and of a fragment of Corundum with vitreous lustre, 3,954. It may be objected to me, that Bergman has stated the variety of specific gravity in gems to be so great, as to leave no certain rule of judging thereby of the species. He observed, that the topaz generally prevails in weight, being from 3,460 to 4,560; the ruby from 3,180 to 4,240; then the sapphire, from 3,650 to 3,940. But in the preceding page he had said, “Analysi crystallorum, tam ejusdem quam diversæ figuræ, multum lucis scientia expectat. Illæ quarum antea compositionem explorare licuit, naturali forma per artem private erant.” It is not, therefore, an hypothesis unworthy of examination which I advance, that gems derived from the rectangled octoedra, whose specific gravity is above 3,300 to 3,800, will be found to be diamonds or octoedral rubies; and these will be easily distinguished from each other, by their lustre and hardness. Diamonds, whether red, yellow, blue, or white, being hardest, though their specific gravity will be less; viz. from 3,356 to 3,471, as I found among different diamonds in my collection: whereas the octoedral ruby was from 3,571 to 3,625, and inferior in hardness, not only to the diamond, but to the Corundum; the specific gravity of which, in its different appearance of form and colour, I found to vary from 3,876 to 4,166; and I suppose it to be subject to a variation from 3,300 to 4,300: after which, the jargon will come, with a specific gravity of 4,600; easily distinguished also, by its crystallization, from the abovementioned gems. The above specific gravities, Mr. Hatchett very obligingly assisted me in taking, with his accurate scales, in the temperature of 60°. It will not be understood that I depend entirely on the specific gravity; on the contrary, I connect this quality with crystallization: hardness is the next criterion; and analysis must separate the component parts, and demonstrate the analogy or identity of substances, or of compounds. The improvements of Mr. Klaproth’s process are evident, by the comparison of his first analysis, and his last analysis, of Corundum. That the analysis of sapphire by Mr. Klaproth may be compared, it is here added. Iron ore crystallized is often mixed with the Chinese Corundum, as I have before stated, and may be considered as accidentally interposed, not combined. In the Corundum of the Coast, the greenish colour may indicate the combination of iron, as the blue colour does in the sapphire; and the proportion of iron in both is nearly alike. There then is the 5 50/100 and 6 50/100 of silex in Corundum, evidently an integral part of the coarse Corundum crystal, and not of the sapphire; but it will require an analysis of the vitreous or pellucid Corundum, to decide that silex is a constituent part of Corundum: there will then remain to account for the calcareous earth; and, having established its being a constituent part of the sapphire, the small proportion of 0 5/100, cannot be expected to produce a very notable difference. It is not necessary to do more than thus to hint at what further analysis and examination of former experiments are required, to ascertain the analogy or identity of the sapphire and Oriental ruby with Corundum. I have before stated, that I have Corundum (which has the same texture and fracture as the common colourless Corundum) of a ruby red, and also of sapphire blue, and of sapphire blue and white colours. I have sapphires, yellow and blue, white and blue, brown and greenish, and of a purplish hue; these I should consider as Corundum, with fracture of vitreous lustre. Mr. Tranckell, who resides in Ceylon, and from whose communications I derived lately much information, had, about five years ago, a sapphire, the greater part blue, and the remainder of a pale ruby colour. I saw, in Romé de l’Isle’s collection, at Paris, a small gem, which was yellow, blue, and red, in distinct spots, and he called it Oriental ruby. M. de la Metherie, to avoid the confusion of the denomination Oriental ruby with octoedral ruby, calls it a sapphire; with more correctness, I think, the abovementioned gems should be classed as argillaceous, under the denomination of Corundum. I am not uninformed that Corundum is said to be found in France. The Count de Bournon is convinced, that the specimens mentioned in Crell’s Journal, as having been found by him in a granite in the Forez, were Corundum. M. Morveau also says, he found it in Bretagne; but the Abbé Hauy, in No. 28 of the Journal des Mines, asserts, that the Corundum found in France is titanite: he does not say whether this observation extends both to the Corundum of Bretagne and that of the Forez. In the same manner I had observed, in the specimens which Mr. Raspe called Jade, or a new substance, from Tiree, on the west coast of Scotland, a great resemblance to Corundum; but, having then only had a cursory view of the substance, I am indebted to Mr. Hatchett for the examination of a specimen of it which he had from Mr. Raspe’s collection. The Tiree stone resembles crystallized Corundum of the Coast, in texture and colour; it is also as refractory, when examined by the blow-pipe, with different fluxes. Its specific gravity is 3,049; consequently nearer the specific gravity of pure Corundum than the abovementioned lump, 2,785, and the matrix of Corundum, 2,768. The Tiree stone will scratch glass readily, but not rock crystal; its hardness therefore corresponds with that of the matrix of Corundum. The substance of the lump described in page 410, cuts glass, and rock crystal, and the Tiree stone, readily. It will therefore be sufficient for me to say, that there is great probability Corundum may be found in Great Britain, and on the continent of Europe, as well as in Asia; and the above slight assays may show, that observations on Corundum, in its different states of purity, may lead to accurate distinction between substances hitherto imperfectly known, and will lead to a revision of the siliceous genus, whereby the argillaceous genus may obtain its due pre-eminence in mineralogy. When gems, by art, or by rolling in the beds of rivers, have been deprived of the angles of their crystals, they are unavoidably subjected to uncertain external characters, which even great practice cannot render certain; and hence the unwillingness of European jewellers to deal in coloured gems. I have some specimens of a sapphire-blue stone, India cut, very small and pellucid; they were purchased in India, as sapphires, and were supposed to be fluor by a lapidary in London, but are cyanite. The above could scarcely have happened, if the stones had been of sufficient size and value to require much examination, the weight and degree of hardness being exceedingly deficient. The colour, therefore, will not be a safe guide. The diamond, whether white, blue, red, yellow, or green, can be distinguished by its crystal, or by its specific gravity and hardness, or, when it is polished, by its lustre. Other stones which compose the order of gems, might equally depend on their crystallization, specific gravity, polish, and hardness, for a distinct arrangement. The near relation of argil, which Bergman gave to this order, is daily confirmed; and it will perhaps be to Mr. Klaproth, more than to any other existing chemist, that we shall owe our correct information on the subject of other gems, as we do on the subject of Corundum. Many of the varieties of Corundum, particularly the coloured and transparent sorts, with their regular crystallizations, are yet desiderata. Many crystallized stones, from defect of colour, lustre, &c. are of little value in the market, such as, jargon, chrysolite, tourmaline; and an infinity of unnamed stones of Ceylon, Pegu, Siam, &c. would be valuable to the mineralogist, if obtained adhering to their strata, and in crystals whose external form is not obliterated. I have no doubt, when it is known how much such information will tend to illustrate the history of the earth, and particularly that of gems, the spirit of inquiry, so laudably afloat in British India, will be directed to attain it. Having mentioned the varieties of crystallized and amorphous Corundum, and the miscellaneous facts relative to my collection of that substance from India and China, it might be sufficient to give an icon of the crystal, and close a paper already prolix; but, having with satisfaction observed, within the last years, the science of mineralogy gaining ground in Great Britain, from the knowledge acquired by several gentlemen who have examined the mines, and formed personal acquaintance with the most experienced and learned men on the Continent, and also from ingenious foreigners, who have communicated their observations on English fossils, and connected them with the most approved systems, it may perhaps be accepted as a sufficient apology for what follows, that I consider it as a desideratum to English mineralogists, to be invited to a preference of permanent characters, which the study of crystallization has collected, and which promises to be a certain method of ascertaining the laws by which elective attraction arranges and combines molecules of matter. It is true, the progress of crystallography has been extremely slow, and different nations have contributed to its present improvement. It is rather remarkable, that the earliest treatise on metallurgy, of authority, was published in Italy, by Vanoccius Biringuccius, just before Agricola published his treatise in 1546 in Germany; and the first treatise on the structure of crystals I know, is also from Italy, by Nicolas Steno, Prodromus Dissertationis de Solido intra Solidum naturaliter contento. Florentiæ, 1669, in 4to. A work of great merit. Lours Bourguet of Neufchatel, in his Lettres sur la Formation des Sels et des Crystaux. Amst. 1729, 12°, connected, by observation and measure, triangular and rhomboidal, and cubic and pyramidal tetraedal molecules, for all different substances. His contemporary, Maurice Antoine Capeller,  attempted to deduce a system from geometrical principles; and in this state did Linnæus find the subject, when he attempted to reduce the science of minerals to external characters, and crystallized bodies to salts. None of the observations of Linnæus will prove useless to science; but his system alarmed the chemists and mineralogists, who rejected every other criterion than internal character from analysis, and the system of Cronstedt was preferred by general assent. 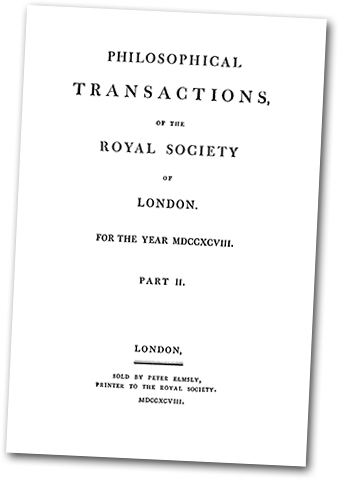 By this means, a spirit of controversy deprived the chemist and lythologist of mutual assistance; and the general opinion was correct, on the supposition that a mixed system of chemical and external characters would be irreconcileable; but it has been admitted, even by those who most decidedly opposed Linnæus’s system, that the best system of mineralogy should be founded on external and internal characters combined. Among the few who ventured to profess their obligations, at the same time, to Linnæus and to Cronstedt, was Baron Born, whose abilities and character, in addition to his distinction as one of the counsellors of mines of his Imperial Majesty, obtained his enrollment among the Fellows of the Royal Society. He connected the intrinsic and extrinsic characters of minerals, in the Index Fossilium, which he published in 1772. In Sweden, Bergman’s treatise on the forms of crystals, published in the Upsal Transactions, in 1773, was a more authoritative recommendation to the investigation of the principles of crystallization; and it can be of little importance for me to add, that since I have possessed the collection of Baron Born, in 1773, I have had every confirmation of the same opinion. The progress of chemistry and of crystallography, applied to mineralogy, has rendered the examination of strata, and of mines, a source of amusement as well as instruction; and the arrangement of interesting facts, in the chemistry and mechanism of nature, suits my occasional researches in geology, which, from variety of avocations and circumstances, have been very much interrupted. My acknowledgment of obligation to the learned who have made this progress in science, is the best recommendation I can give to others to examine their works. Those whose talents and time are devoted to the investigation of every mineral substance, can have no respite to their labour; minerals, in every state of their formation, perfection, and decomposition, as they occur in mines, must have their qualities immediately ascertained, and be reserved for profit, or thrown away on the heap. The practical miner could not, without external characters, make any progress. The valuable minerals are soon pointed out by assay, and their appearance remembered. The accuracy of selection depended, in all periods, much on the experience of the miners. It remained for Mr. Werner to give the utmost degree of accuracy which irregular external characters can acquire, by fixing appropriate terms to all the characters which occur, and which the senses can discriminate. In 1774, he opened his system of external characters of minerals, and the perfection he has since given to it, has rendered it very general. The Leskean collection, arranged after Mr. Werner’s method, has procured, in Mr. Kirwan, a powerful support to the introduction of that system in this country; and we have already some other valuable publications, to recommend and introduce other favourite systems of the Continent. It is, therefore, at this time the English mineralogist should be invited to examine, if not to prefer, permanent characters, so far as the progress of crystallography has collected them, or at least to give them a distinguished rank among external characters of bodies. If prejudice too long has retarded the union of intrinsic and extrinsic characters, it has also occasioned a schism among the advocates of crystallography. 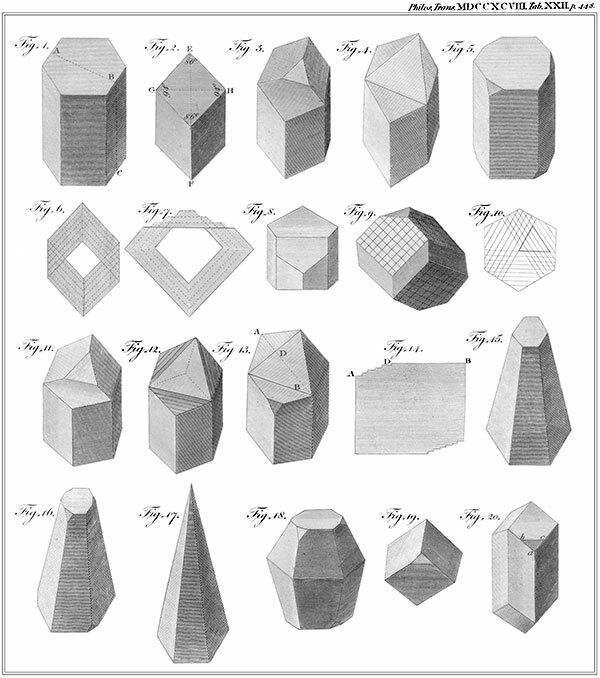 Romé de l’Isle, in the year 1772, published the first edition of his Essay on Crystallography, which he states to be a supplement to Linnæus; and, by the assistance of a very few friends, he was enabled to increase the number of crystals in a degree to assume the appearance of a system. He told me, that the accuracy of his measurement of angles of minute crystals was the acquirement of great practice, but that the Count de Bournon, after a short practice, attained equal correctness, and afforded him assistance, which he acknowledges in his 2d edition to have received, particularly by the discovery of crystals in Dauphiné, Auvergne, Franche-Comté, &c.
The Abbé Hauy, an accurate and patient observer, and a good mathematician, considered crystallography as founded on certain laws, reducible to demonstration by calculation. In the beginning, the differences of Bourguet and Capeller were not more pointed than those of Romé de l’Isle and the Abbé Hauy; but the progress of observation and calculation having demonstrated their mutual utility, the observer and measurer of crystals will now rest satisfied only when calculation confirms actual measurement. To the Abbé Hauy is also due a late scheme to simplify calculation, by expressing, according to algebraical formulæ, the different laws which determine the modifications of crystals. So far as they are the result of calculation and measurement, we may admit the laws of crystallization; for, whenever the superposition, or subtraction, of simple or compound molecules on a nucleus, shall, by calculation, give a series of planes and angles, which corresponds exactly to the angles and planes measured on natural crystals, it will amount to no more nor less than a demonstration of the rule or arrangement of elective attraction by figures. The forms of fragments in Corundum are all acute rhomboids. The cosine of the little angle in Corundum is 1/7 of the radius; but, in calcareous spar, the cosine is 1/5 of the radius; in shorl, 2/5 of the radius; in the garnet, 1/3; and, in rock crystal, 1/17. Thus, the application of general laws, to ascertain constant character, after they shall have been fully verified, may be very simple and general. It will not require perfect crystals; for, when crystals separate into laminæ, which subdivide into fragments, and shew the form or arrangement of their molecules, it is easy, from such fragments, to connect them with their primitive crystal, and consequently with their class. It will be a great step, to obtain one regular and permanent external character. Attention to other characters will be necessary, to ascertain the nature of the substance; and other external characters, such as irregular fracture, colour, &c. must be resorted to, where no permanent characters exist; but from their nature they are fallible, and in fact are seldom conclusive. The progress of crystallography appearing to me of consequence to the progress of mineralogy, induced me to desire the Count de Bournon, abovementioned, one of the honourable victims to his allegiance to his King, to describe such crystals, in my collection, as shewed the different known modifications of Corundum; which will develop the theory of crystallization, so far as is consistent with the avowed object of this Paper. The subject, I believe, has not hitherto been submitted to the consideration of this Society. The translation of the Count de Bournon’s description has been carefully made to preserve its clearness, and I hope it will be favourably received by the Society, and make some amends for my tedious introduction. After it, I have added a table, connecting in one view the specific gravities of Corundum, &c. herein mentioned, with those given by other authors. An Analytical Description of the Crystalline Forms of Corundum, from the East Indies, and from China. By the Count de Bournon. The most usual form of Corundum is a regular hexædral prism; (Tab. XXII. fig. 1.) in general, the surface of the crystal is rough, with little lustre, owing to unfavourable circumstances under which it crystallized. The crystals of Corundum hitherto found were not formed in cavities, where, each crystal being insulated, its surface could preserve that smoothness and natural brilliancy which are common to all substances that freely assume a crystalline form. Like the crystals of feldspar which we meet with in the porphyroid granites, the Corundum crystals have been enveloped, at the time of their crystallization, by the substance of the rock which was forming, at the same time with themselves, in an imperfect and confused crystalline mass; and the Corundum crystal, before it had acquired its perfect solidity, necessarily received on its surface the impression of the different particles of the rock which enveloped them: this naturally renders the surface rough and dull. Crystals of feldspar found in the granitic porphyroid rocks, exhibit the same kind of appearance, from the same cause. The Corundum crystals are in general opaque, or at least they have only an imperfect transparency at the edges: when broken into thin fragments, the pieces are semi-transparent: when held between the eye and the light, and examined with a powerful lens, it will be perceived that their interior texture is rendered dull by an infinite number of small flaws crossing each other, much resembling the medullary part of wood, when it is viewed in the same manner. The degree of transparency of the small interstices which are between these flaws, is further evidence that this texture of small flaws occasions opacity, which augments in proportion to the thickness of the fragments. This kind of internal structure has also a very strong analogy with that of feldspar in granite and porphyry. The endeavour to split these crystals, in a direction either perpendicular or parallel to their axes, meets with a very considerable resistance: they may indeed be broken in these directions; but the rugged and irregular surface of the broken parts, clearly proves that the direction in which the crystalline laminæ have been deposited one upon another, has not been followed. The regular hexædral prism of these crystals, cannot therefore be considered as the form of the nucleus of the crystal; and consequently is not the primitive form of the crystals of this substance. If, in order to discover the direction of the crystalline laminæ, a variety of crystals be examined, some will hardly fail to be met with, which, on their solid angles, formed by the junction of the sides of the prism with the planes of the extremities, present small isosceles triangles. These are sometimes greater and sometimes smaller, and form solid angles of 122° 34', with the extreme planes of the crystal. They are in some instances real faces of the crystal; but most frequently they evidently are the effect of some violence on that part. The smoothness and brilliancy of these small faces, in the latter case, shew that a piece has been detached in the natural direction of the crystalline laminæ. It is indeed much less difficult to separate a portion of the crystal at these angles, than at any other part; and, in following the natural direction of the faces, with a little patience and dexterity, all the crystalline laminæ may be detached, and progressively increase the size of the triangular face. This operation, however, cannot be done indiscriminately on all the solid angles of the crystals, but only on the alternate ones at the same extremity, and in a contrary direction to each other. As to the other angles, they may be broken, but it is impossible to detach them. When, instead of the solid angles of a hexædral prism, small triangular planes are met with, (which frequently happens, whether caused by violence or otherwise,) they are always placed in the direction above-mentioned. If, by following this indication of nature, we continue to detach the crystalline laminæ, we shall at last cause the form of the hexædral prism to disappear totally, and, in place of it, a rhomboidal parallelopiped will be obtained, (fig. 2.) of which the plane angles at the rhombs will be 86° and 94°; the solid angles at the summit  will measure 84° 31'; and that taken at the re-union of the bases will be 95° 29'. We can split this parallelopiped only in a direction parallel to its faces; it will still consequently preserve the same form, which is that of the nucleus of this substance, and its primitive form. It is, therefore, by a modification of the rhomboidal parallelopiped, (fig. 2.) that nature has formed the regular hexædral prism (fig. 1.) which this substance presents. For, if we conceive, that in any period whatever of the increase of the rhomboidal parallelopiped, a series of laminæ or crystalline plates has been deposited on all the sides of the parallelopiped; and that these laminæ have all undergone a progressive decrease of one row of crystalline molecules, at the acute angle which tends to form the summit, and also along the sides of the opposite acute angle, (fig. 3. and 4.) there will necessarily result from the continuation of this superposition, to a certain period, an hexædral prism, terminated by two triedral pyramids, placed in a contrary direction; and their planes or faces, which form a solid angle of 147° 26', with the sides of the prism, will be either pentagonal, (fig, 3.) or triangular. (Fig. 4.) They will also have, in place of a summit, an equilateral triangular plane, sometimes greater and sometimes smaller. In the same manner, viz. by a decrease on the lower edges of the laminæ, the primitive rhomboidal parallelopiped of calcareous spar passes to a regular hexædral prism of that substance; though more frequently it does so by a decrease on the lower angles of the laminæ. When, the laminæ of the Corundum crystal have, during their superposition on the planes of the primitive rhomboidal parallelopiped, experienced a progressive decrease at one of their acute angles, and along the sides of the other, at the same time, and in the same proportion, it is easy to conceive that the height of the hexædral prism must be the same as that of the rhomboidal parallelopiped, upon which it has been formed. The height BC (fig. 1.) must therefore bear the same proportion to the line AB, drawn through the middle of the two opposite sides of the planes on the extremities, as the whole height EF, of the rhomboidal parallelopiped, (fig. 2.) bears to the small diagonal GH, from one of the rhombs; that is, nearly as 6,45 : 5. But, although this exact proportion appears in a very great number of Corundum crystals, yet we meet with some whose lengths are more or less considerable; and this is owing to different circumstances which have existed at the time of their crystallization. We may conceive, for instance, that if, before the progressive decrease of the crystalline laminæ, in the manner abovementioned, the increase of the rhomboidal parallelopiped had taken place by a superposition of laminæ, in which the rows of crystalline molecules experienced a progressive decrease along the edges of the acute angle of the base only, (fig. 6.) and that (the sides of the prism having already acquired a certain length) the succeeding crystalline laminæ had experienced a decrease at the acute angle of the summit, the same regular hexædral prism would have resulted from this process; but the proportion between the height and the line drawn from two of the opposite sides of the planes on the extremities, would have been much greater than that of 645 : 5; and, consequently, this prism would have been longer than that of the rhomboidal parallelopiped which served as its nucleus. On the other hand, if the increase of the rhomboidal parallelopiped had taken place by a superposition of crystalline laminæ, decreasing at the acute angle of the summit, and, some time after, decreasing also along the sides of the acute angle of the base, (fig, 7.) the regular hexædral prism resulting from this process would have been shorter, in proportion to the duration of the mode of decrease in the crystalline laminæ which were first deposited. There are some of the hexædral prisms, in Corundum crystals, which are so short, that they appear no more than segments. Calcareous spar offers the same phenomenon; as do likewise all the substances in which the hexædral prism has any analogy of formation with that which we have here described. It happens frequently, when the superposition of the crystalline laminæ does not go on equally on all the faces of the rhomboidal parallelopiped, that one or two only of the solid angles of the hexædral prism, taken alternately, still shew, by small isosceles, triangular planes, some remains of the faces of the parallelopiped, while the others do not shew any at all. Mr. Greville, in his collection of this substance, has a crystal of Corundum, upon one side of which, only two of the planes of the rhomb have experienced an equal and perfect superposition, while there has been but a very small number of crystalline laminæ: deposited on the third plane. Consequently, this crystal presents a regular hexædral prism, one of whose solid angles is so much truncated, that the half of the plane of the end of the hexædral prism disappears; (fig, 8,) and this cut or section forms an angle of 122° 34', with the plane on the extremity. These lines are owing to the extremities of the laminæ which have been deposited on the inferior faces, corresponding with those on which we observe them; and they serve to corroborate still farther, the demonstration we have given of the formation of the regular hexædral prism in this substance. We frequently see small rhombs traced on the surface of the planes, on the ends of the hexædral prism. (Fig. 10.) This, no doubt, is occasioned also by the intersection of the laminæ, on the planes of the primitive rhomboidal parallelopiped. But these rhombs, formed by the re-union of lines that join in angles of 60° and 120°, instead of 86° and 94°, (like those we have seen traced on the faces which correspond with those of the rhomboidal parallelopiped,) form angles of 60° and 120°. It would therefore be an error to consider them as indications of the form of the elements of crystallization, as we are tempted to do from a simple inspection of the crystal. These same lines form equilateral triangles with one another, as may be seen in fig. 10. The cause of these small equilateral triangles, which sometimes project a little over the planes on the ends of the prism, must now be obvious. If, during the superposition of the crystalline laminæ on all the planes of the rhomboidal parallelopiped, it has happened, from any cause whatever, that the laminæ deposited on the three faces of the same summit, have not fallen exactly on those which preceded them, or that they have experienced some deviation, or have not had the same decrease as all the others, at the angle of 86°, these triangles must necessarily occur; in the same manner it must be obvious, why these small equilateral triangular projections are frequently placed on one of the sides of the crystal. The primitive form of the Corundum crystal is therefore a rhomboidal parallelopiped, whose solid angle at the summit is 84° 31', and that formed by the re-union of the bases is 95° 29'. Although the rhomboidal parallelepiped of 86° and 94° is the primitive form of the Corundum crystal, yet it is rare to meet with that substance under this perfect and determined form; and, in most mineral substances, it is more rare to meet with their primitive crystals than their different modifications. Amongst Mr. Greville’s numerous specimens of Corundum, I have met with only one which has this primitive form, and it is doubtful whether even this may not be a fragment. The Corundum crystal presents another modification, under which the regular hexædral prism, instead of having three alternate solid angles at each of its ends, (on which solid angles are placed isosceles triangular planes, forming a solid angle of 122° 34', with the planes at the extremities upon which they are inclined,) has also its angles supplied by isosceles triangular planes; but these planes, instead of 122° 34', form solid angles of 160° 42', with the said planes on the extremities. (See fig. 11. and 12.) These new planes, which constitute a new modification of the primitive form of Corundum, are the result of a different order in the decrease of the laminæ; which, in the primitive form, are deposited on the planes of its primitive rhomboid by single rows of crystalline molecules, and increase the planes which terminate the hexædron: whereas, in this second modification, the decrease of molecules is by two rows, which gives a more obtuse inclination, and forms new planes. The surface is usually striated, parallel to the sides of the planes which terminate this crystal; an appearance always announcing imperfection in the crystallization, arising either from a change in the order of decrease or increase, or from a less perfect union of the crystalline laminæ. A section would show gradual risings or steps, as appears in fig. 14. which is a section of fig. 13. in the line ADB. These striæ are not to be confounded with those in numberless substances, as in tourmalines, schorls, &c. which arise from the longitudinal union of numberless distinct crystals. The crystal resulting from this new mode of decrease in the crystalline laminæ, will represent one or other of the varieties shewn in fig. 11, 12, and 13, according to the period when such decrease has begun in the process of the crystallization; and, if it has begun very late, the new faces will only be small, nay almost imperceptible, isosceles triangles, forming solid angles of 160° 42', with the planes of the extremities of the prism, as in fig. 5.; the measure of the angles however must be excepted. If this irregular mode of decrease had begun with the first crystalline laminæ which were deposited on the primitive rhomboidal parallelopiped, the hexædral prism resulting therefrom would have been terminated by two very obtuse triedral pyramids, whose planes would have been rhombs; and they would have been placed in a contrary direction to each other, as may be seen in fig. 12, by the dotted lines. I have not met with this variety, but its existence may be supposed. It happens sometimes, that the crystallization has not been so perfect as to destroy every appearance of the faces of the primitive rhomboidal parallelopiped; in this case, there remains, on the solid angle of 112°, formed by the junction of the new faces with the edges of the prism, a small isosceles triangle, as in fig. 13, which corresponds to those in fig. 5. of the preceding modification. The crystals which explained the second modification, form also a part of Mr. Greville’s collection: one, in particular, is highly worthy of notice; it is the most perfect crystal I have ever seen of this substance. The surface of the faces of the prism, although rough, is infinitely less so than that of the others, and much more brilliant. The planes on the ends have the usual polish of crystals; its colour is a pale red, and its transparency may be compared to that of wax. This substance presents a third modification, in which the hexædral prism diminishes in diameter, as is apparent by comparing the diameters of its two ends; in some, it appears like a regular hexædral pyramid truncated. (Fig. 15.) The crystals of this modification are usually irregular, and seldom admit of a certain measure of their angles; but, among the numerous specimens in Mr. Greville’s collection, I have been able to ascertain, in the greater part, that the hexagonal plane at the top forms angles of about 120°, with the planes of the pyramid; and the hexagonal plane at the base forms angles of about 78°, with the planes of the pyramid. In other instances, the form of the pyramid varies greatly; in some, the angle at the upper plane was 100°,and the angle at the base about 70°; in others, the angle at the upper plane was about 100°, and the one at the lower plane about 8o°. Filially, if, during the formation of the crystal, in this modification, it should happen that the laminæ deposited on the three planes of the rhomboidal parallelopiped, on the side where they undergo a greater decrease, do not undergo the decrease of one row of molecules at the acute angle of the summit, the crystal will be a real hexædral pyramid, (fig 17.) whose acute angle at the summit, measured on the sides, will be nearly 24°, in one of the varieties; 40° for the most obtuse; and 20° for the most acute variety: the angle of their triangular planes, in the first instance, 13° 41'; in the second, 22° 20'; and 11° 28' in the third. I have not seen any perfect pyramids; but, in many, the hexagonal plane terminating the pyramid is so small, that it renders its total suppression probable. This decrease necessarily produces a single pyramid, as abovementioned; nevertheless, there are instances of crystals of Corundum, belonging to the variety where the terminal planes make, with the planes of the pyramid, a solid angle of about 100°, in which, two pyramids of the same dimensions, having their summit replaced by a small hexagonal plane, are placed base to base. I have also observed, among the crystals of the obtuse variety abovementioned, in Mr. Greville’s collection, an instance of the decrease taking place by several rows, on one three-sided pyramid of the primitive rhomboid, and by single rows on the other. Consequently, the crystal is a short regular hexædral prism, terminating on one end only by an hexædral pyramid; the planes of which, as well as of the prism, are alternately broad and narrow, and almost perfect; its apex being replaced by a very small plane. I shall conclude, by mentioning a variety of Corundum, described by the Abbé Hauy, in the Journal des Mines, No. 28; in which, the edges of the terminal planes of the hexædral prism are replaced by planes which form an angle of 116° 31', with the terminal planes; but, in the numerous collection of Mr. Greville, I have not seen this variety. One crystal had an appearance of such planes; but, on examination, it was clearly accidental. The authority of the Abbé Hauy, in crystallography, is so great, that the existence of such modification ought not to be denied, without further examination; though I cannot in this instance adopt it: he derives this variety, which he calls subpyramidal, from a decrease of three rows of molecules, at the angles of the base of the two pyramids of the primitive rhomboid; and he seems to attribute the same formation to the pyramidal variety with double pyramid, which he supposes may exist. The primitive crystals, and the first and second modifications of Corundum, are from the Peninsula of India. The third modification, or the pyramidal variety, is from China; nothing approaching this form being among the specimens which Mr. Greville received from the Peninsula of India. The preceding observations, and particularly the last mentioned modification of Corundum, compared with the best descriptions of the sapphire, suggest the further examination of the degree of connection, if not of identity, of these Oriental stones. In both, the hexædral pyramids are usually incomplete in their apex, and they vary in acuteness. I have stated the degree in which the solid angles of the pyramid (taken as complete) vary, in Corundum, to be from 20° to 40°. Romé de l’Isle states, that the sapphire varies from 20° to 30°. The Abbé Hauy (Journal de Physique, Aug. 1793,) mentions two varieties of the sapphire, one measuring at the solid angle of the pyramid 40° 6', the other 57° 24'. I never saw a sapphire with so obtuse an angle as the last; but many, whose angle at the top, if the pyramid had been complete, would have been the same as that of the Corundum. Besides the analogy between the crystals of Corundum and the sapphire, by the union of two hexædral pyramids at their base, it also exists by the measure of their angles; and both substances are subject to the same irregularity, sometimes appearing as a single hexædral pyramid, and sometimes as an hexædral prism; moreover, the sapphire sometimes has on its solid angles, alternately, the same triangular planes, (fig. 5.) and also the prominent triangles on the planes of the extremities, (fig. 10.) which often appear in the crystals of Corundum. The Abbé Hauy, in the Journal de Physique, August, 1793, names this variety, Orientale Enneagone, which is represented in the annexed Plate, (fig. 18.) and says, that the small triangular planes make, with the terminal planes, an angle of 122° 18'; and, in the description of the same triangular planes in the Corundum, (fig. 16.) it appears, that these planes are the remains of the planes of the primitive rhomboid, and form, with the terminal planes, an angle of 122° 34'. Perhaps the rhomboidal crystal, which Romé de l’Isle had given as one of the forms of the sapphire, should be restored to it. He had examined it at M. Jacquemin’s, jeweller to the crown, (Cristallographie, 1. edit. p. 221.) and he suppressed it in his second edition, but often expressed to me his regret in having made the alteration. I have before me a letter from that celebrated naturalist, dated September, 1784,  in which he inclosed, for my opinion, a copy of a letter he had received from Mr. Werner, with models of some crystals; among them, two called by him rubies; one a rhomboid, of which the angles of the summit are substituted by planes, (fig. 19.) the other is precisely the same as fig. 3, 4, and 5, of the annexed Plate. The first of these rubies has exactly the same form as I have represented in Plate IV. fig. 60. of my Cristallographie, viz. a rhomboidal parallelopiped, truncated at each of its obtuse angles, by an equilateral triangular plane. You will have a correct idea of the other crystal, if you suppose the crystal represented in Plate IV. fig. 87. truncated at each of the summits of its pyramids, by an equilateral triangular plane, as in the preceding modification, but deeper, and in so great a degree, that the three rhombic planes of each pyramid disappear, with the exception of three isosceles triangles; this modification differs from the first, only by the hexædral prism, and the deeper truncature at the summits of the pyramids. It is therefore clear, that if the primitive rhomboid of Corundum decreased only at the superior angles of its laminæ, it would exhibit exactly the first of these varieties of Mr. Werner’s ruby, as in the annexed fig. 19. As to the second variety of Mr. Werner’s ruby, it is equally clear, if in fig. 87, referred to by Romé de l’Isle, (represented by the annexed fig. 20.) no more of the pyramid was left than the three small triangles b, a, c, there would be precisely one of the forms of Corundum before described, to which the annexed figure 5 belongs. It may perhaps be objected, that the laminæ appear to be parallel to the terminal planes, in the sapphire, and inclined, in the Corundum. There are crystals of Corundum, in which, very frequently, the laminæ appear parallel to the terminal plane; I was at first, and for some time, deceived by that appearance. In other Corundum crystals, the laminæ appear to be parallel to the prismatic planes; and, to conclude the instances of analogy, the superposition of rhomboidal laminæ is sometimes observable in Oriental rubies and sapphires. It was by this appearance, Mr. Greville was led to try the effect of cutting the forementioned stones en cabochon; whereby a similar effect of triple reflection, which formed stars of six rays from a common centre, was produced in the Oriental ruby, in the sapphire, and in the Corundum. It is to be lamented that Mr. Werner did not send, with his models, the specific gravity of each of the rubies, and the measures of their angles: we should then have had data to decide, whether the rubies sent by Mr. Werner were, as I suppose them to be, Oriental rubies, or sapphires; and, with equal certainty, whether the parallelopipedal rhomboid corresponds precisely with that of the Corundum; by this, the perfect identity, or analogy, between the Corundum and the sapphire, would have been no longer doubtful. Topaz, Ruby, and Diamond, on different Authorities. Hatchett and Greville 2,768 * Matrix of Corundum. Coast. H. and G. 2,785 * Lump of Corundum. Coast. Hatchett and Greville 3,876 * Corone. Bengal. Hatchett and Greville 3,950 * Crystal of Corundum. Coast. H. and G. 3,954 * Ditto with vitreous cross fracture. Coast. H. and G. 3,959 * Ruby-coloured. Coast. H. and G. 3,962 * Crystal. China. Brisson 3,130 Brasilian; probably a topaz. Hatchett and Greville 4,000† * Greyish star-stone. Hatchett and Greville 4,035† Blue star-stone. Hatchett and Greville 4,083† * Pale blue crystal. Werner 3,464 Light blue. Brazil. Brisson 3,536 Dark yellow. Brazil. Werner 3,540 Dark yellow. Brazil. Hatchett and Greville 3,571 * Octoedral crystal. H. and G. 3,625 * Macle of octoedral crystal. Hatchett and Greville 4,166 * Salam ruby. Star-stone. Coast. Hatchett and Greville 3,356 Perfect crystal. Hatchett and Greville 3,471 Aggregate crystal. The mark * distinguishes the specimens in my collection, to which I have referred in the foregoing Paper. The mark † distinguishes the stones which, from their specific gravity, I think belong to the genus of Corundum. The generic name Corundum, I am in the habit of giving to those sorts which have a sparry or a granulated fracture. When Corundum has a vitreous cross fracture, I call it sapphire; and distinguish its varieties by their colours, white, red, blue, yellow, green; and by the accidental reflection of light from their laminæ: when in one direction, I call the sapphire chatoyant; when the reflection is compounded of rays which intersect each other, and appear to diverge from a common centre, I call them star-stones, as red, blue, or greyish star-stones, or star-sapphires. 1. The above is the prime cost. I have been informed by correspondents, who purchased some in retail, that it was sold for about six shillings a pound, at Madras. 2. A small group, consisting of three or four octoedral crystals, presents the least common variety of this kind of iron ore; the edges of the octoedra being replaced by planes which almost cover the triangular planes. Romé de l’Isle. Cristallog. Vol. IV. Plate 4. fig. 69. 3. De Terra Gemmarum. Bergm. Opusc. Vol. II. p. 104. 4. Prodromus Crystallographiæ, &c. and Litteræ ad Scheuzerum, de Crystallorum Generatione. Act. Nat. Cur. Vol. IV. Append. p. 9. 5. Nullum itaque est dubium, quin hujusmodi methodus mixta, quæ notis characteristicis tam extrinsecis quam intrinsecis simul combinatis, est superstructa, proxime ad naturalem accedens, maximam indicans symmetriam, reliquis sit præferenda methodis. J. G. Wallerius, de Systemate Mineralogico rite condendo, §. 102. 6. This result is extracted from the Journal de Physique; but it appears, from the Journal des Mines, No. 28, that the Abbé Hauy has since rectified this measure, and given 86° 26' for the acute angle, and 93° 34' for the obtuse angle. 7. For greater clearness, this rhomboidal parallelopiped may be considered as being formed by the junction of two triedral pyramids, base to base; and the two solid angles (each of which is formed by the re-union of three of the acute angles on the planes of the rhomb) will then be considered as the summits of these pyramids. 8. I am at present preparing a work, in which I shall, if circumstances permit me to finish it, give the result of my observations, and my own opinion on this interesting part of mineralogy. I shall only observe here, that although double molecules, square and rhomboidal, are frequently formed in the process of crystallization, yet the real form of the crystalline molecules seems to be triangular. By observing the progress of the rhomboidal parallelopiped, in its passage to the form of an hexædral prism, (fig. 4. and 5.) and by considering the prism terminated, it seems evident, that the last lamina which had been deposited, after the progressive decrease in the rows of crystalline molecules to one single molecule, must necessarily have been triangular. 9. A letter to the same effect was written to M. la Metherie, and published in the Journal de Physique, May, 1787.